Meet the Secretariat What is HMUN? Why HMUN? Esteban Flores is a senior student at Harvard College majoring in Philosophy, with aspirations of attending law school and practicing international law. Having been raised in the Rio Grande Valley—a community in South Texas along the US-Mexican border—issues of regional cooperation and integration have always been important to him. It was in this community that he developed an appreciation for model UN, particularly through his participation in Model Organization of American States where he served as Secretary General of a Texas-wide conference. 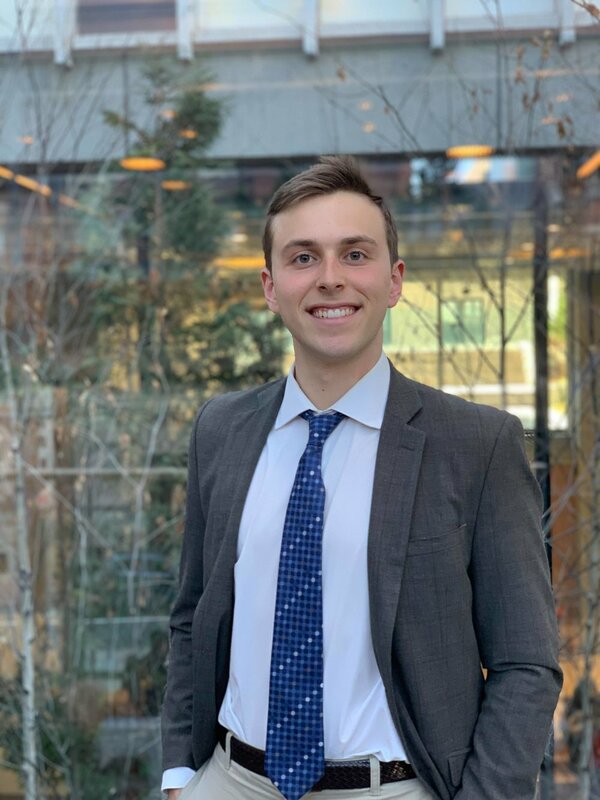 Since coming to Harvard, he has further nurtured his passion for debate and negotiation by joining Harvard’s competitive model UN team, serving on staff for Harvard’s high school and college conferences, and serving as a chair for WorldMUN. Esteban has also pursued his passion for international relations by serving on the Board of Directors for the Harvard International Relations Council and as chair of copy-editing for the Harvard International Review. In his free time, Esteban enjoys reading Kant’s Groundwork and being a referee for Harvard intramural sports. Hailing from a small border town from far-Western Ukraine, Nataliya is a current senior studying a joint concentration in Studies of Women, Gender, and Sexuality and Studies of Slavic Languages and Literature with a secondary in History. She was the Under-Secretary-General for Operations at Harvard Model United Nations 2019, and has participated on both the executive and substantive sides of conference for Harvard National Model United Nations as well. Outside of Model UN, Nataliya is a DJ for Harvard Radio Broadcasting, where she plays alternative and punk music as well as blues classics. Outside of college, Nataliya is the Deputy to the CEO and UN Liaison for Rise, a non-profit which creates legislation for survivors of sexual assault. Nataliya is leading the UN team in the passage of the first ever UNGA resolution to focus solely on survivors of sexual violence. In her spare time, Nataliya enjoys writing poetry, listening to R&B music, and watching Soviet films and soul-reviving sitcoms. Alex is a junior at Harvard College studying Statistics and Data Science originally from Dallas, Texas. He discovered Model United Nations his freshman year and has been in the Administration organ ever since, most recently serving as the Director of Faculty Relations. Alex loves meeting students and faculty advisors at conference and is always amazed at the creativity and hard work the delegates bring to HMUN each year. He believes that Model UN helps young leaders gain the dedication and confidence to change the world for the better. Outside of HMUN, he is interested in using data to learn more about a broad array of subjects, ranging from music to sports. In his free time, Alex enjoys skiing, reading, and running. He is looking forward to an incredible conference in Boston this year. Illan is a sophomore planning on a joint concentration in mathematics and philosophy, with the intention of going into investment banking after college. He grew up surrounded by diversity in downtown Toronto, sparking his interest in the intersection and cooperation of different cultures. This led him to join his high school’s model United Nations team and become the head delegate. While working in the Administration organ for HMUN 2019, Illan discovered how rewarding it could be to help build a conference like the ones that he enjoyed so much. Over that same conference, he also had the opportunity to be exposed to the activities of the business organ, which sparked his interest in leading it for HMUN 2020. In his free time, Illan enjoys running and reading about contemporary ethical dilemmas. Allison Barker is a second-year student at Harvard College concentrating in Psychology. She spent her childhood on the Upper West Side of Manhattan, where she learned the value of diversity and inclusion in problem-solving on all levels, and then moved to the relatively homogenous town of Bronxville, New York, where this belief in the importance of varying viewpoints was further cemented. Allison plans to continue working towards cooperative problem-solving as she progresses in college and hopes to attend law school. Aside from her participation in HMUN, Allison loves teaching health curriculum to high schoolers through the Peer Health Exchange, as well as working in a student-run consulting group and writing for the blog of The Crimson, Harvard College’s newspaper. Allison is so excited to be taking on the role of Comptroller this year, and she can’t wait to support delegates in their collaborative endeavors at the conference. Fatima Shahbaz is a junior at Harvard College pursuing a joint concentration in Government and South Asian Studies. She was originally born in Karachi, Pakistan, but grew up a few minutes outside of Washington, DC—inspiring a lifelong appreciation for politics and international relations. On campus, she serves as the Academic-Political Chair for the Harvard South Asian Association, works as a Diversity Peer Educator, and volunteers as a weekly CIVICS teacher, teaching a class on American politics to fifth graders in the Greater Boston Area. This will be Fatima’s seventh year involved in Model UN, after serving as her high school’s head delegate and conference’s Secretary General and spending the last two years involved in HMUN, and she couldn't be more excited to help make HMUN 2020 a reality. Outside of HMUN, Fatima loves to bake (and eat! ), has a strong interest in makeup and beauty, and probably talks too much. Liam was born and raised in Cambridge, Massachusetts, just minutes from Harvard’s campus. At Harvard, he lives in Leverett House and concentrates in Social Studies with a focus in Economics, Education, and Inequality in the United States with a Secondary in Archaeology. Outside of class, he is involved with Harvard Program for International Education, in which he tutors Boston public school students in international relations. Liam is very excited to be the Under-Secretary General of the General Assembly for HMUN 2020. This will be his sixth HMUN, after three years as a delegate in high school, and serving as Assistant Director for DISEC at HMUN 2018 and Director of ECOFIN at HMUN 2019. Liam loves doing things outdoors, whether it be hiking, skiing, fishing, or just walking around. He is a huge fan of barbeque, the Boston Red Sox, and classic film. When he’s not in class, you can find Liam in Leverett Courtyards playing Spikeball. Grace Sullivan is a junior at Harvard studying Social Studies, a concentration incorporating government, history, and other disciplines within the social sciences. In particular, Grace loves to study legal issues and ethics. She is originally from Baltimore, Maryland. At Harvard, Grace spends her free time teaching American civics class to fifth-graders in Boston and competing in Model United Nations. Last year, Grace directed the Commission on the Status of Women for HNMUN and worked as a director of Business for HMUN. Grace also enjoys being a director for HMUN China, HMUN’s sister conference for high schoolers in Beijing. Grace is thrilled to be serving as Under-Secretary-General for the Economic and Social Council and Regional Bodies. She is especially eager to continue the legacy of her favorite organ by emphasizing innovation and impactful debate for all delegates. Roshni is a junior at Harvard College studying Social studies with a secondary in Global Health and Health Policy. She’s from Calcutta, India.On campus, she works as a Teaching Fellow for American Foreign Policy and as a Research Assistant at the Harvard Kennedy School. She intends to pursue humanitarian work in the future, particularly with women in conflict zones, and to that end leads the Harvard Undergraduate Legal Committee and works with refugees and women who have survived gender based violence. She has been doing Model UN since she arrived on campus and has found her home in the HMUN community. She was an Assistant Director at HMUN India when she was a sophomore in high school and that experience led her to apply to the United States for college. So, she is immensely grateful to HMUN and can’t wait to make this conference an incredible experience for all delegates!